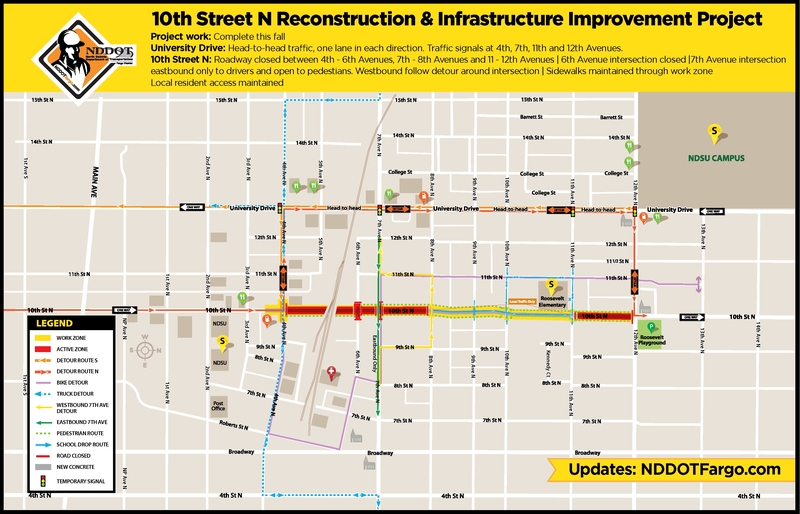 This week drivers will encounter cross-traffic and access changes in the 10th Street North reconstruction work zone. Starting tomorrow, Thursday October 4, traffic control will be removed to open the eastbound direction of 7th Avenue North. The westbound direction and all directions of pedestrian access through the 7th Avenue N intersection will open after crews complete work on the 700 block sidewalks and ADA ramps at the intersection next week. Motorists wishing to continue westbound on 7th Avenue N traffic should use 8th Avenue N intersection. Later this week, crews will move into 600 block and 6th Avenue N intersection of 10th Street N. The intersection and block will close to all driving traffic when work begins on roadway removals and underground utility work. Pedestrian access will be maintained for north/south travel through the intersection and along the 600 block. Traffic control was removed through the 12th Avenue North intersection and all driving lanes were restored to motorists for east/west and travel north on 10th Street N from the area earlier this week. Contractors for the North Dakota Department of Transportation (NDDOT) Fargo District and City of Fargo 10th Street N improvement project are also working to prepare the 1100 block for paving operations next week. Throughout the remaining project work will continue on the boulevard seeding, signal work, curb, sidewalks, retaining wall and lift station under the railroad underpass. Upcoming new work starting soon includes permanent signing and striping. On 10th Street N a driving loop with a single driving lane is open between 9th Avenue North to 11th Avenue N intersections to assist with drop-off/pick-ups at the school. Local traffic is not be able to continue north at 11th Avenue N intersection with the underground and paving operations occurring between the intersections. BIKE DETOUR ROUTE: 11th Street N, 4th and 6th Avenue N, and Roberts Street. The route will shift to 8th Avenue N when work begins at 6th Avenue N intersection. As a reminder, this construction project is to replace aging infrastructure and continuing the city-wide effort to upgrade services for residents and businesses on 10th Street N from 4th Avenue N to 12th Avenue N. By the completion of the project in late fall, north Fargo drivers, residents and businesses will have new concrete driving surface, new curb and gutter, street lights, sidewalks, city utilities, new lift station and the installation of sanitary sewer force main in the project limits.